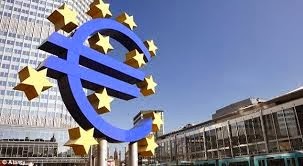 The ECB meets on Thursday amid heightened speculation it will make a new initiative given the deterioration of the two pillars of its monetary policy, money supply and inflation. These factors coupled with the continued decline in excess liquidity, and the elevated and volatile EONIA, many suspect there pressure has heightened on the ECB to act. Most observers have focused on cutting the repo rate 10-25 bp. Others have raised the prospect of a negative deposit rate. Some have also suggested the formal end to the sterilization of the SMP purchases, which involves draining of liquidity. In recent weeks, there has been a noticeable increase in failures to fully neutralize the addition of liquidity provided by the SMP. We see things a bit differently. First, believe that ECB officials see the deflation in some peripheral countries as being largely desirable. The deflation has been dubbed "internal devaluation" which is the alternative to and exit from monetary union and external devaluation. It is welcome sign that the competitiveness of such countries are being enhanced. There is a oft told story about two boys being chased by a tiger. One boy stops and puts on his running shoes. The other says, "What are you doing? You won't be able to outrun the tiger". And the first boy responded, "I don't have to out run the tiger, I just have to out run you." German inflation is low at 1.2% on the harmonized measure. If countries are going to boost their competitiveness vis a vis Germany, they have to have lower inflation than it. Germany's low inflation exerts disinflationary pressure on not only the periphery, but France as well. The push back is that the CPI picks up increases in the VAT and other administered prices and hence exaggerates inflation. In addition, there is a belief, that like inflation, by the time policy makers see deflation it is already behind the curve. With signs that the economic recovery in the euro area is both deepening and broadening, the ECB expects inflation to remain low, but not enter deflationary territory. Draghi has often said that even though CPI is below its medium term target, inflation expectations are anchored. In effect, then the slippage of measured inflation is offset by somewhat stronger economic activity, leaving the trajectory of nominal GDP relatively unscathed by the disinflation. Second, the problem in the euro area is not the price of money. It is that small and medium size businesses are little access to capital. Lowing the refi rate will do little to stimulate lending. As we have seen recently, EONIA has traded through the repo rate. This is to say the repo rate itself is not the ceiling on short term rates. Moreover, it is not just the level of EONIA that is an issue, but its volatility. Cutting the repo rate then will neither address the level of volatility of the EONIA. Cutting the lending rate, which is the upper bound of the ECB's rate corridor would more effective on both counts. That said, we haven't seen much discussion of this. Third, the reduction of excess liquidity in the euro area is a source of consternation. It has helped lift EONIA and is a source of volatility. Many see this as a compelling the ECB to act. Yet as this Bloomberg chart shows, excess liquidity has risen in recent weeks and is now at its highest level since late December. Of course, as European banks continue to pay down the LTRO borrowings (and not simply shift to the borrowing to the main refi operation), excess liquidity may resume its decline. To this end, there is much discussion of formally ending attempts to sterilize the SMP sovereign bond purchases conducted under ECB President Trichet. The sterilization was Trichet's way around the rule-based approach that would seem to prohibit quantitative easing. Still, it was so controversial that the two German members of the ECB (Weber and Stark) resigned in protest. While refraining from sterilizing the SMP purchases would boost excess liquidity, we suspect it would still be controversial and could possibly open a new front in the legal challenges of the ECB. It may even influence the outcome of the German Constitutional Court ruling (expected now in April) on whether Draghi's OMT (Outright Market Transactions) scheme is in violation of German law. Another way to boost excess liquidity in the euro area is to reduce the required reserves. The ECB has already cut required reserves from 2% to 1%. While another reduction in required reserves may not seem particularly likely at the moment, it would probably be less controversial than formally ending the sterilization efforts. Fourth, there has been increased speculation that the ECB could adopt a negative deposit rate. This has been bandied about ever since the ECB put the deposit rate at zero. Officials have long said that they are technically ready for such a move. Still, as now major country has adopted a negative deposit rate, including Japan, despite years of deflation and near-zero interest rates, it poses what we might call a known unknown. We regard this option as extreme. It would do little good and risks doing harm. It would squeeze the very banks that the ECB seems to be concerned about. It would be disruptive of money markets. It is unlikely that it would boost lending to households or small and medium sized businesses. Fifth, there are two general proposals to boost lending itself. Some have proposed a new long-term repo (LTRO). Yet, given the stress tests, it is unlikely that the strong banks will take the funds. That would create a stigma would those banks that would tap into it. Note that earlier LTROs did not boost lending to households and SMEs. There is little reason to expect a new one to succeed where the earlier ones failed. In order to turn it into a "funding for lending" scheme, access to the funds could be linked to new lending. While we are sympathetic such a course, we are not sure that the odds of success are very high. The other strategy, suggested by ECB President Draghi, is to buy bank bonds and specifically, simply asset backed bonds (backed by loans to households and SMEs). We have previously argued that the efforts by US officials to facilitate the re-opening of the securitization market was an important, even if under appreciated, of the US financial and economic recovery. While we think this course is the most promising, the problem is that it cannot be immediately implemented. France might be among the best positioned to benefit for such a program and appears to be a strong advocate. 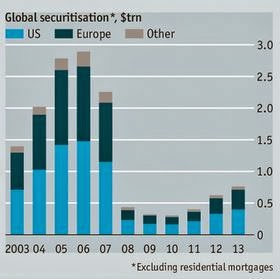 The chart to the right from the Economist shows how the crisis saw the implosion of the securitization market, even excluding residential mortgages. In 2006, the European market was about a quarter of the size of the US market. Last year, according to Dealogic, it was a tenth of the size. There are some intermediary steps that can be taken to reduce the high capital charges (regulatory capital requirements). This would complement the direction that global regulatory bodies are already moving. Draghi has surprised the markets several times since assuming office and each time it was in a more accommodative direction. In Q4 13, he did not wait for the updated staff forecasts to cut the repo rate. This modus operandi also serves to boost investor uncertainty ahead of the ECB meeting. Some observers have argued that the strength of the euro is also a source of deflationary pressure. Given the uncertainty, but calls for action, the ECB may be in a bit of a box. Market disappointment will likely spur further euro gains. Some would like to see Draghi make a strong push against the euro's strength. Yet, here too the ECB's hands are constrained. The ECB does not target the exchange rate, but does use it as an input into its economic analysis. In summary, we would see a repo rate cut as largely symbolic. A cut in the lending rate would likely be more effective. We think the odds of a negative deposit rate are low at this juncture. Efforts to boost lending through incentives for securitization are more promising, but still require some more groundwork and time. Disappointment with the ECB will likely be expressed through a stronger euro.